I give up on this, you will see what I mean the moment you can sim in PoB. Only thing I stand corrected on is the way AoF works since I looked it up, still think that Breath of Flames is superior to Force shaper, but SiM will show that later. The build looks pretty solid and Purifying Flame is my favourite of the new skills released so I might start the league with it. One question tho, is Augury of Penitence really worth taking over Inevitable Judgement? I know PoB does it's own thing but I tought dealing damage to an enemy with 0% fire resistance would be better than dealing 16% increased elemental damage to nearby enemies (since we're ranged). Other than that I can't wait to try the skill out in game, thanks for the guide! Augury of Penitence ie a huge damage multiplier because it makes enemies take #% increased damage, which is kind of different from your regular increased damage on the tree. We actually treat enemies like they have negative resistances, because our penetration + enemy resistance debuffs are higher than their usual fire resistance because of Elemental/Fire Penetration we get on the tree and from skill gems. Endgame bosses like Shaper have 40% Elemental Resistances. Wave of Conviction lowers their resistance by 25%, bringing it to 15%. Combustion support then lowers their resistance by 19%, bringing it to -4%. We can bring it even lower using the Helmet mod that comes from fossils (mentioned in the equipment section) and certain points on the tree. You're just confusing the way decreases/increases work together. If you had 500% increased damage and 100% decreaaed damage, it wouldn't make you deal no damage. It will make you deal (500-100)% increased damage. - getting 100% decreased/reduced critical strike chance WITHOUT having any increases. We actually treat enemies like they have negative resistances, because our pwnetration + enemy resistance debuffs are higher than their usual fire resistance because of Elemental/Fire Penetration we get on the tree and from skill gems. Gotcha, thanks for the quick anwser, definitely gonna try this as a league start. Also, we had already seen Purifying Flame's gem numbers and they are higher in every aspect (except cast time, its the same) when compared to Bladefall. 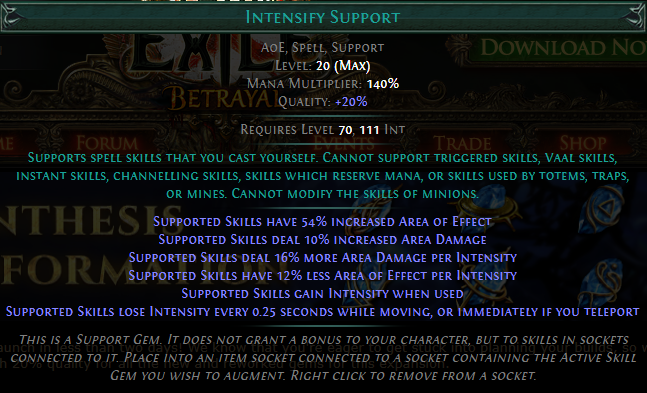 One more question, what do you think about Intensify support instead of Inc AoE/Conc Effect swapping? Intensify and Unleash look more than great for this build. I will change the guide so it features Intensify instead of AoE/Conc. Unleash may be a great addition too, but I'll wait until PoB gets updated to check how it works. Build looks very interesting. Commenting just to have it saved for future reference. i think gonna try this build to for this leagues. Those Consecrated ground buff is kinda interesting to check out.